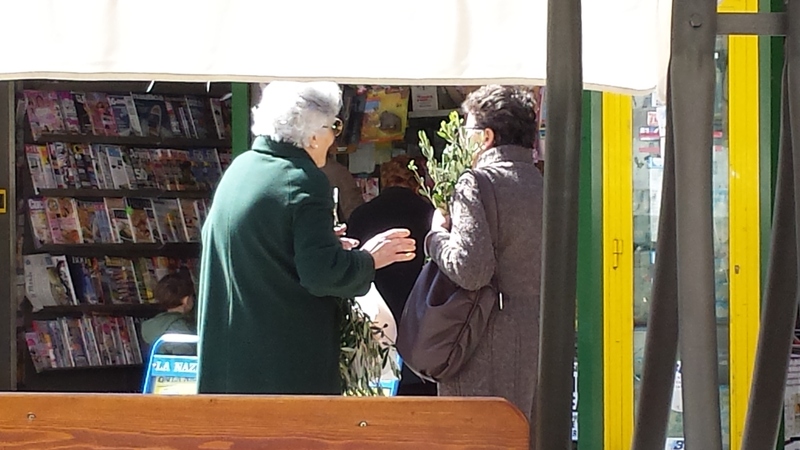 Montespertoli ladies with olive branches. So there we were, in Montespertoli for the first time in six months, enjoying an aperitivo in the piazza in glorious sunshine and watching the world go by. Then the churchgoers started to parade past us and we realised that it must be Palm Sunday, because everyone was carrying an olive branch. Either that, or there had been a mass raid of the local olive groves to take cuttings for new planting. Well of course it was the former, however, I have to say that a number of olive groves have been devastated by bugs and have been dug up and burnt. So it would not surprise me if some of these branches were not taken home and stuck into rooting compost. I know that a lot of you girlies out there are keen on Italian men, so when I saw this picture in a magazine in the bar, I thought I would share it with you. There is nothing like sharing my morning coffee with a hunky Armani man (of course my own Englishman is just as gorgeous), but then I saw this Perofil man and knew you would love it. However, unless you find very good vintage, I think it is important for you to realise that Italian men do deteriorate over the years. However, whilst the old boys may lose their looks, they never lose their charm! 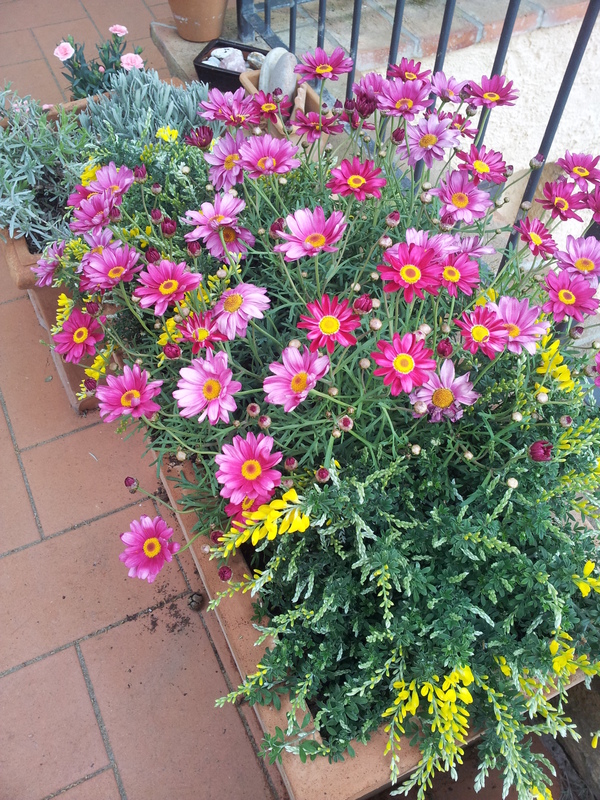 Now it has been a busy week, what with my lovely sister-in-law ( mia cognata) arriving to do the spring pots and therefore a visit to the garden centre in Poggibonsi was necessary. Wednesday and Thursday were damp and miserable, so the planting on the terraces only really got going on the Friday. So mia cognata and I were forced to go out to lunch at C’era Una Volta, or Paolo’s, as we affectionately call the restaurant. Paolo has been making his yummy leek and potato soup, especially as he knows how much I like it. We also went back on Friday evening when my man returned from London. He had arrived earlier at the station with our fourteen year old grandson, who is back from Blundells for a three-week Easter school holiday. So we had a jolly gathering at the Jazz Caffe in Certaldo for cocktails, before the grandson went home with our daughter who lives near Volterra. Saturday was hectic, with lunch at our daughter’s farmhouse, then an evening with our lovely Bavarian friends and the Australian couple who had bought our old rented home across the valley at La Selva. I won’t tell you the whole story, but due to the good company, wine and loud music, we ended up dancing around pretending to be Mick Jagger and various other guitar playing rockers. I know, I can hear you saying, so what’s new! Talking about rocking, I am being very good and exercising the voice every day, well most days! Time is rushing by and my next Rock Concert will be here before we know it! If you will be in Tuscany on the 20th June, and would like an invite, send your email address to june.finnigan@virgin.net. 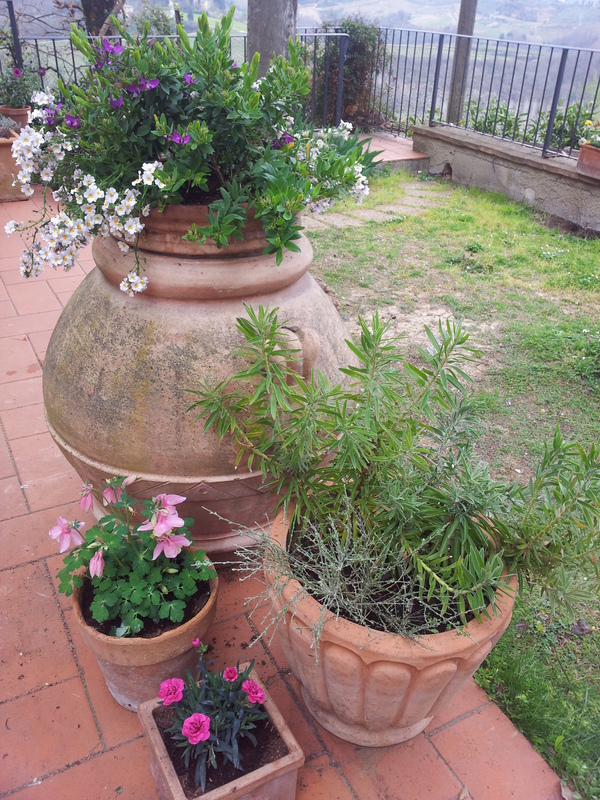 Back in the garden, the flowering pots on the terrace were looking fabulous. I expected to take some pictures in bright sunshine this morning, however, its clouded over again! But despite that, the light has turned out to be quite good so here is a taste of the beautiful displays created by mia Cognata, who is such a star. 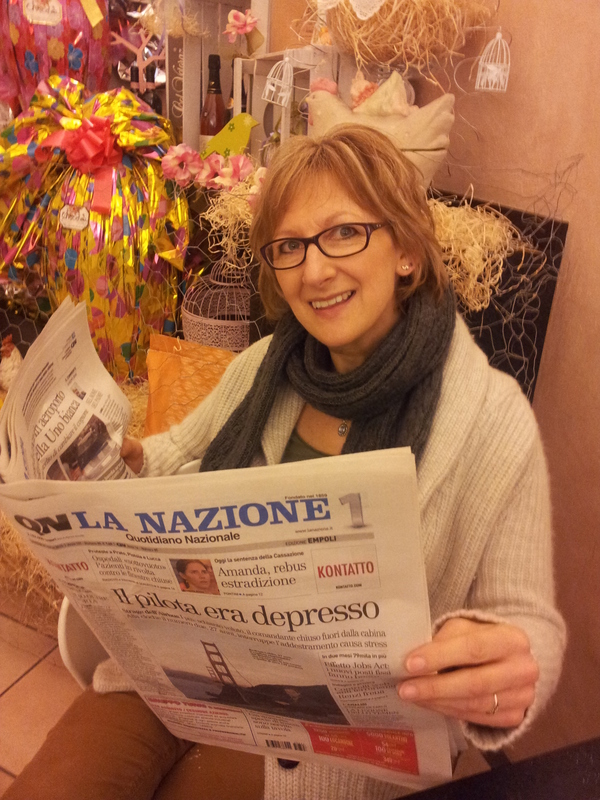 Meanwhile, back at caffè Bar Solferino in Certaldo, she enjoys a much deserved coffee in front of the amazing giant Easter eggs that are on display there. Cluster of planted pots on the upper terrace. La Cognata at caffè Bar Solferino in Certaldo with giant Easter Eggs. Well, I really must get on with the final proof reading of ‘The Bolivian Connection’ as I know you are all itching to read it. I have a couple of issues with the publisher, however, I expect to notify you of it being ready and on sale in the next couple of days. Wishing you all a fabulous week from Tuscany. Almost there with the Bolivian Connection! Very good.